ALS Research Forum | FUS: A Poison in the Ribosomal Well in ALS? RNA-binding proteins including FUS accumulate in the cytoplasm of motor neurons in ALS. But why this buildup contributes to the disease remains hotly debated (March 2018 feature; see also September 2013, October 2017, March 2018, October 2018 news). Now, a research team led by University of Kentucky’s Haining Zhu reports that ALS/FTD-linked mutant FUS blocks the production of proteins by about 30% – at least in skin cells derived from people with the disease. 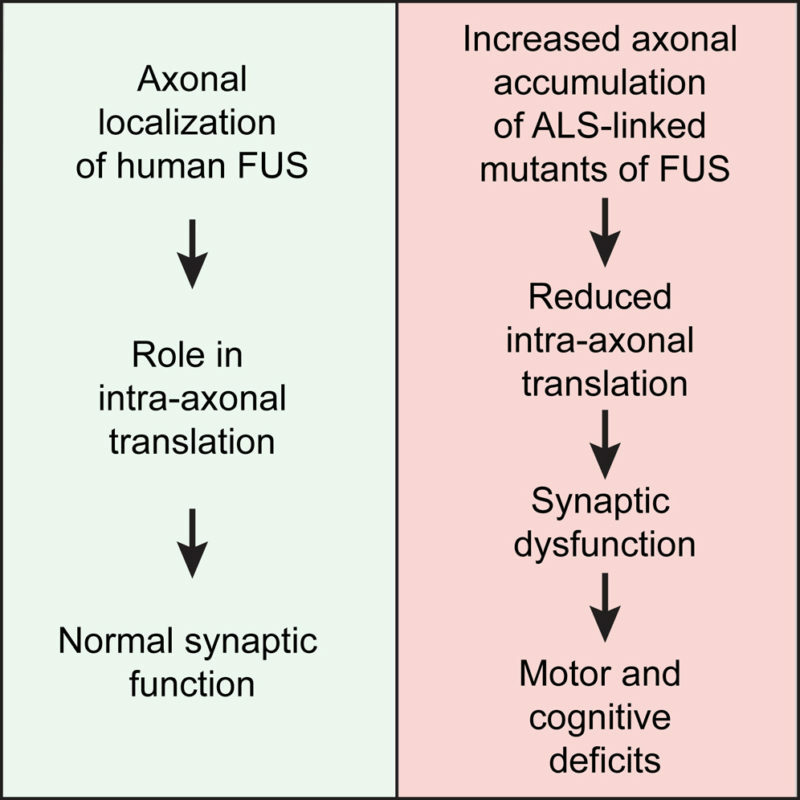 The findings come at the heels of previous studies of ALS model mice led by Don Cleveland and Sandrine Da Cruz at the University of California in San Diego, which found that mutant FUS blocks the synthesis of key proteins in axons including proteins needed to help keep neurons connected (November 2018 news; López-Erauskin et al., 2018). Together, the results add to growing evidence that ALS-linked proteins including FUS may contribute to motor neuron toxicity by blocking the synthesis of essential proteins (see February 2017, June 2018 news; Coyne et al., 2014; Majumder et al., 2016). The findings appeared on November 19 in the Proceedings of the National Academy of Sciences. Efforts to develop therapies that reduce levels of cytoplasmic FUS in motor neurons are currently underway (see March 2018, April 2018 news). Stay tuned. To learn more about the emerging role of protein synthesis block in ALS, check out In New ALS/FTD Mouse Model, Poly(GR) Peptides Poison Ribosomes. Kamelgarn M, Chen J, Kuang L, Jin H, Kasarskis EJ, Zhu H. ALS mutations of FUS suppress protein translation and disrupt the regulation of nonsense-mediated decay. Proc Natl Acad Sci U S A. 2018 Nov 19. pii: 201810413. [PubMed]. López-Erauskin J, Tadokoro T, Baughn MW, Myers B, McAlonis-Downes M, Chillon-Marinas C, Asiaban JN, Artates J, Bui AT, Vetto AP, Lee SK, Le AV, Sun Y, Jambeau M, Boubaker J, Swing D, Qiu J, Hicks GG, Ouyang Z, Fu XD, Tessarollo L, Ling SC, Parone PA, Shaw CE, Marsala M, Lagier-Tourenne C, Cleveland DW, Da Cruz S. ALS/FTD-Linked Mutation in FUS Suppresses Intra-axonal Protein Synthesis and Drives Disease Without Nuclear Loss-of-Function of FUS. Neuron. 2018 Nov 21;100(4):816-830.e7. [PubMed]. Majumder P, Chu JF, Chatterjee B, Swamy KB, Shen CJ. Co-regulation of mRNA translation by TDP-43 and Fragile X Syndrome protein FMRP. Acta Neuropathol. 2016 Nov;132(5):721-738. [PubMed]. Coyne AN, Siddegowda BB, Estes PS, Johannesmeyer J, Kovalik T, Daniel SG, Pearson A, Bowser R, Zarnescu DC. Futsch/MAP1B mRNA is a translational target of TDP-43 and is neuroprotective in a Drosophila model of amyotrophic lateral sclerosis. J Neurosci. 2014 Nov 26;34(48):15962-74. [PubMed]. Coyne AN, Zaepfel BL, Zarnescu DC. Failure to Deliver and Translate-New Insights into RNA Dysregulation in ALS. Front Cell Neurosci. 2017 Aug 17;11:243. [PubMed].